With the 2018-19 season now underway, it’s time to begin our annual prospect rankings series. As always, we start at the bottom with the prospects rated from 31st to 38th. * – One exception to this rule is Victor Mete. While he technically still qualified (he was at 49 NHL games heading into the season), it’s clear that he has established himself as an NHL regular and the only reason he didn’t get that extra game was his injury. Accordingly, we’re classifying him as a graduated prospect. Included with each ranking is an estimate of each prospects’ NHL readiness date. For some players, the estimate is a specific season while others whose projected development paths are harder to determine will be in a range. A legitimate case could be made that despite repeating the junior level in Sweden, Henrikson actually took a step back last year. He had a limited role on his team and did not really progress as the season went on. He’s trying his hand in North America as one of the older players in the USHL but is off to a quiet start to his year. NHL ETA: 2023-24 – He’s now going the college route where his development, if all went well, would still be extremely slow. It’s telling that Montreal didn’t invite him to their development camp in July; it’s clear that they no longer view him as an actual prospect. In his junior year, Koberstein still has not really progressed from being a depth player. He wasn’t a healthy scratch at any point during the season and that was about the highlight of his campaign. He’s now in his senior season where he remains a fringe player on their back end and instead of focusing on getting an entry-level deal from the Habs, his sights should be set on landing an ECHL PTO after the season. NHL ETA: 2021-22 – Once he’s finished his college career, he’ll need a few years in the minors. The problem is, I’m not sure he’s good enough to get a minor league deal. Koberstein was also absent from camp in July, suggesting the Habs have written him off completely as well. It was only a year ago that there was a bit of optimism surrounding Waked. He was coming off of a strong season in junior and actually looked pretty good in preseason action in Montreal. Unfortunately, it went downhill from there. Waked was quickly cast as a fourth line energy player and seldom moved out of that role, even when there were injuries. It didn’t suit him particularly well and he was basically an afterthought for most of the year. He has been sent to the ECHL to start the season which, quite frankly, is where he should have been last year. He’ll at least get a chance to work on his all-around game and a good showing in Maine might help restore his value. NHL ETA: 2021-22 – Last year wound up effectively being a write-off for Waked. This season should be used to develop him in a top-six role in the ECHL before working his way back to a regular role in Laval. To go through that full transition of being where he is now and NHL-ready is a three-year route if all goes well. Montreal’s recent traditions of trading back into the seventh round continued with their selection of Stapley who was in his second season of eligibility. While he improved his production in his second season, he didn’t exactly light up the league, finishing tied for 15th in scoring. The 19-year-old is now off to Denver where he has made the jump the college hockey without going through the USHL. Clearly, the Canadiens are banking on him becoming a go-to player at the NCAA level but as is often the case with players going that route, he’ll be a long-term prospect. That’s not necessarily a bad way to go with wildcard picks at the back of the draft. NHL ETA: 2023-24 – It’s difficult to project Stapley lighting up the college level quickly enough that he doesn’t spend the four full years there. If he does well enough to land an entry-level deal, he’ll also likely need some time in the minors before really being ready. With the number of injuries that Laval had last season, Audette didn’t get to spend much time in a supporting cast role and as a result, he was back in a top-six role for the most part. While he was a bit better compared to his rookie campaign, he showed that he still wasn’t capable of being a consistent contributor offensively. For a player whose calling card is his offence, that’s not ideal. With the extra depth brought in over the summer, Audette finds himself in a fourth line spot to start the season. He’ll need to work his way up the depth chart and become a key cog of their attack if he wants to land a second contract at the end of the season. NHL ETA: 2020-21 – Given his relative stagnation last season, it’s hard to see him being NHL ready after 2018-19. Audette needs to show enough that he can be viewed as a top-six AHL forward and then next season (if brought back), work his way onto the top line. If he does that, he’ll have an outside NHL chance. Failing that, he’s destined to bounce around the minors. I have to admit, I was a bit surprised that Montreal actually signed Pezzetta, especially given the extra pickups they made in the UDFA market. Despite being a fourth-year OHL player, he still wasn’t able to reach the point-per-game mark, something that should be a given for a top-six forward in the second year following being drafted. Suffice it to say, offence won’t be his calling card at the professional level. The Habs are clearly banking on him being a capable fourth line energy centre that is above average on the draw, can play with a physical edge, and isn’t a liability when it comes to skating and defensive play. That doesn’t exactly sound like an exciting scouting report for an NHL prospect but if he pans out, he could fill a useful role in the NHL. NHL ETA: 2021-22 – With the depth that Laval has, it’s likely that Pezzetta (when healthy) is going to be on the fringes of the lineup and it wouldn’t be surprising to see him get some ECHL time as well. While a player of this particular profile could move quickly, it’s going to take a while for him to really get a chance to make his mark. Verbeek is another player who failed to crack the point-per-game mark in the OHL which doesn’t bode well for his offensive upside. However, he did take some strides towards improving in that area last season, scoring 30 goals which were more than his previous three years put together. 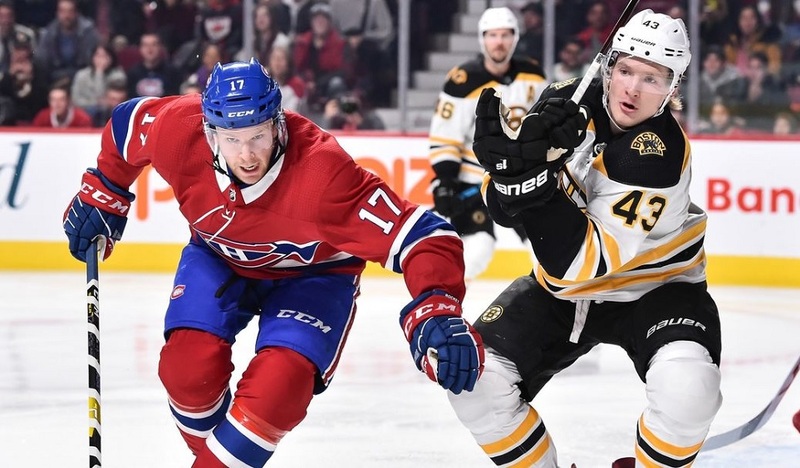 At just 5’9, he doesn’t fit the model of the old age fourth line player but with speed becoming a bigger weapon (and the Canadiens transitioning to playing faster), he’s the type of player that could hold his own on an NHL fourth line. His upside is rather limited (fourth liner that can kill penalties) but he should at least be a capable role player in the minors for a few seasons. 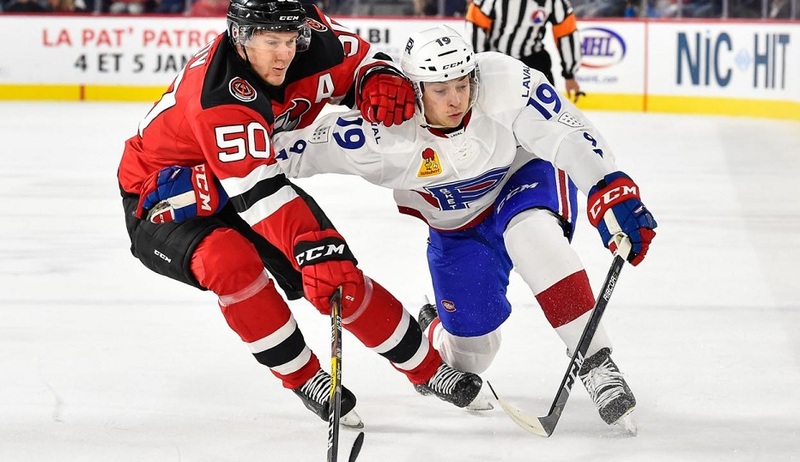 NHL ETA: 2021-22 – Like Pezzetta, Verbeek is going to be on the bubble in Laval when it comes to playing time and as a result, it wouldn’t be surprising to see him go back and forth between there and the ECHL. That’s going to slow down his development curve. It has been quite the fall from grace in recent years for Shinkaruk. His first foray at the minor league level was promising and it looked like he had legitimate NHL upside. He was even better in his second season but since then, it has gone downhill in a hurry. After clearing waivers for the first time last year, Shinkaruk responded with the worst season of his professional career thus far and played a middle-six role in Stockton. That got him dealt to the Habs a couple of months ago and he has since cleared waivers and finds himself in a middle-six role in Laval. Time is quickly running out on his NHL chances. 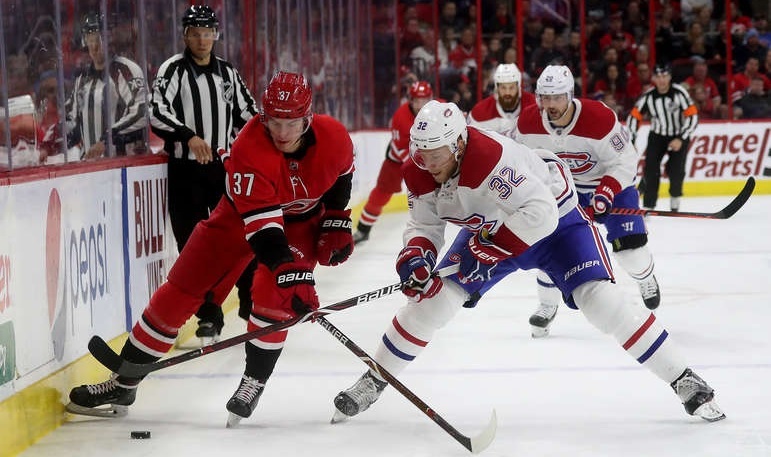 NHL ETA: 2019-20 – He’s not ready for full-time NHL duty now and if he doesn’t show some improvement with the Rocket this season, Shinkaruk probably isn’t going to get another chance; it’s likely that he’ll have to head overseas. There’s a lot at stake for him this season. From here on out in the series, the rankings will be posted in groups of five.